If you do much cooking, you’ll understand this dilemma: Your fridge is dotted with an almost comical assortment of odds and ends. You know, those special ingredients purchased for other recipes, but the recipe only calls for a portion of that special ingredient and the remnants are now shoved to the back of the fridge. Waiting — searching for inspiration. Like these crunchy salmon cakes. I found myself with about a quarter pound of smoked salmon leftover from when Emily was home (she’s a big fan of bagels, cream cheese and smoked salmon), but she wasn’t here long enough to finish it up. Forced to make a play, I opted for salmon burgers. Normally, I would use canned salmon, but I thought the combination of fresh and smoked would be even better. I made my own fresh breadcrumbs — which is to say — I took two hot dog buns out of the freezer, let them thaw and ran them through my food processor with some parsley. Hey – the recipe calls for bread — hot dog buns are bread. Don’t get fussy. Mayonnaise, whole grain dijon mustard and chopped capers along with an egg and the breadcrumbs act as the binding agent. The most important part is to finely dice the salmon (both fresh and smoked). It’ll make it easier to form the cakes. I like tartar sauce, but for these stellar cakes, I went with a tangy, herbed aioli. No need to make a special trip to the store, you’ve probably got everything you need in your refrigerator. Mayonnaise? Check. Garlic? Check. Lemon? Check. Hot sauce? Of course. After the ingredients were combined, I chilled the mixure to make it easier to shape into patties and refrigerated them again to firm up before giving them a dusting of panko breadcrumbs for a crunchy exterior. As usual, Scott was my guinea pig taste-tester and he LOVED them. So did I. We didn’t have much dinner conversation that night, just lots of nodding and satisfied grunts. Do yourself a favor and don’t wait until it’s an “odds and ends” day to make Crunchy Salmon Cakes. Not your average salmon cakes! When you combine fresh and smoked salmon together it changes the profile completely. Trust me, you need this! 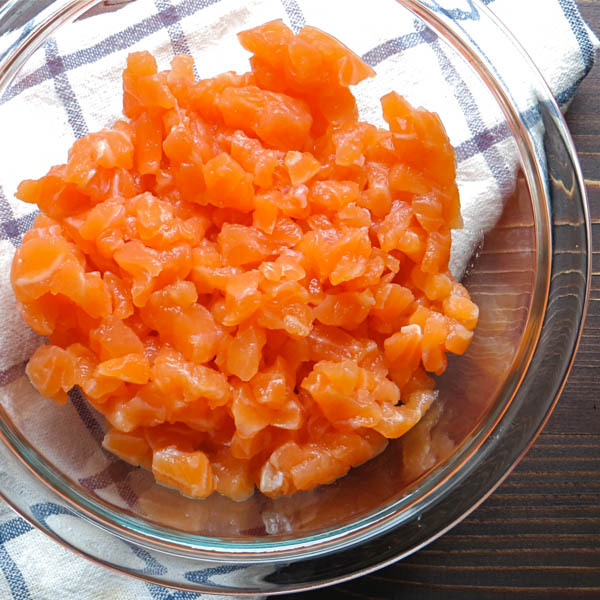 In a bowl, combine the diced salmon and half of the lemon zest. Reserve the other half of the zest for the aioli -- set aside. 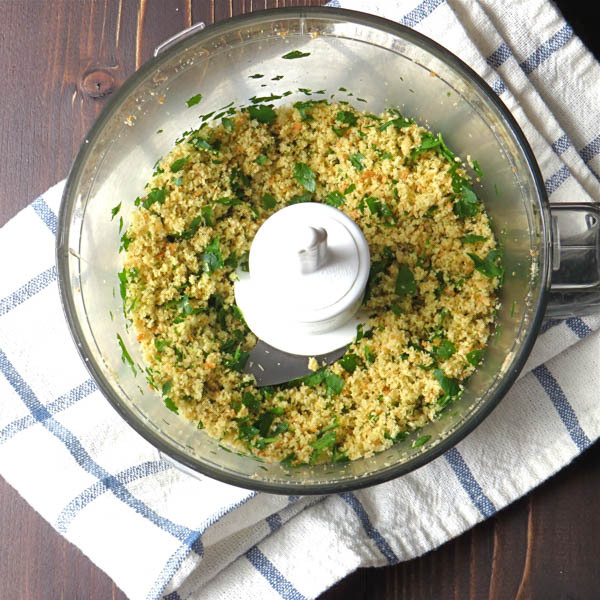 Place the bread and parsley leaves in a small food processor and pulse to make parsley bread crumbs. 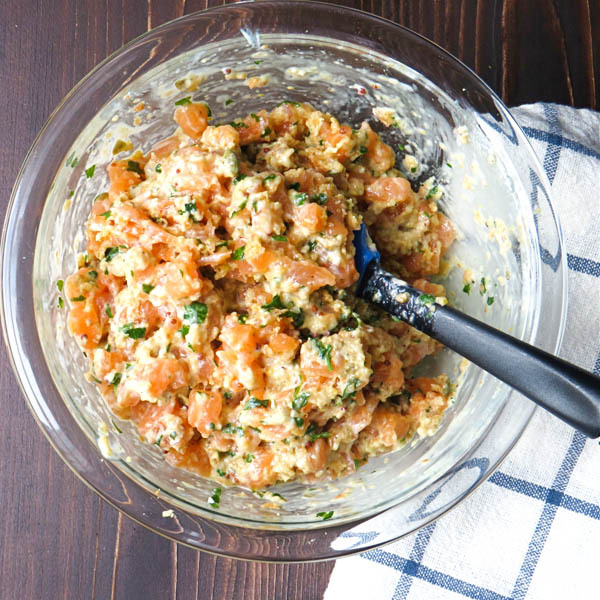 Transfer bread crumbs to the salmon and lightly fold the breadcrumbs and lemon zest into the salmon to evenly distribute. 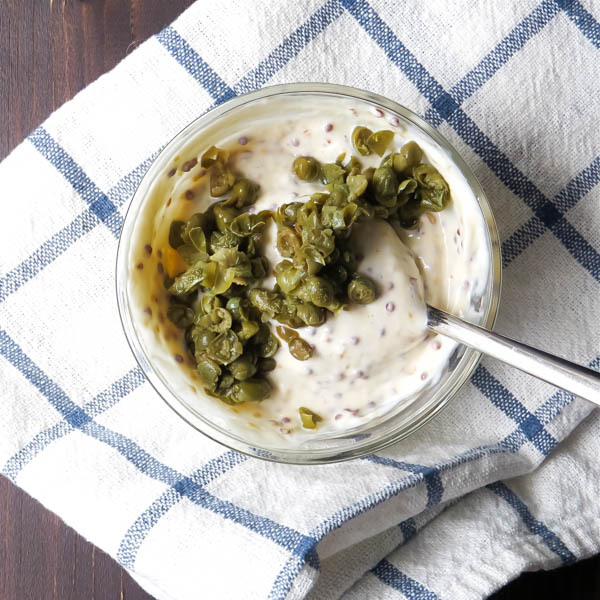 In a small bowl combine the mayonnaise, dijon mustard, capers, kosher salt and black pepper and stir well. 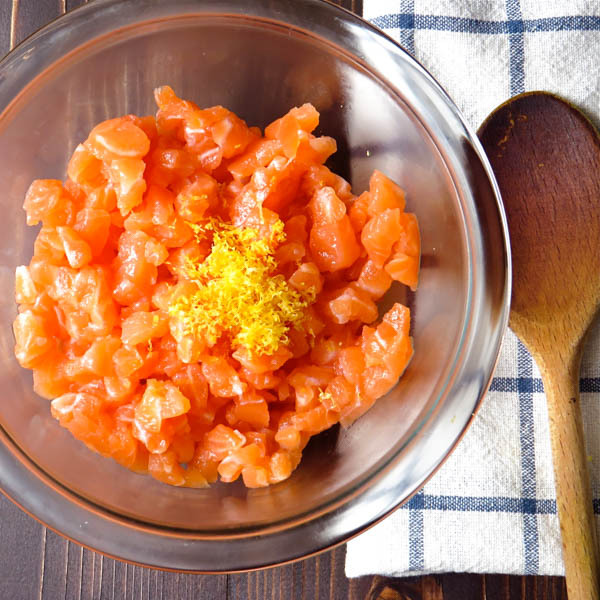 Add the mayonnaise mixture and egg to the salmon and fold in well to combine. Chill the salmon for 30 minutes to an hour before continuing. Meanwhile prepare the aioli. 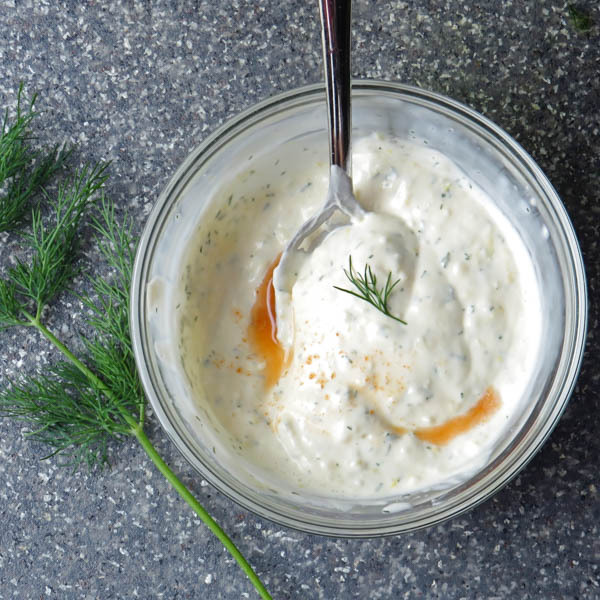 In a small bowl combine the mayonnaise, garlic, the other half of the lemon zest, dill, lemon juice and hot sauce. Stir to combine and refrigerate. Divide the salmon into six equal parts and form patties out of each. Place panko in a shallow bowl and place a salmon cake on top, lightly pressing so the panko sticks to the salmon. Flip the salmon cake over and press panko into the other side. Place a skillet over medium heat to preheat the pan. (I used a cast iron skillet, but non-stick and regular fry pans work too.) Add a tablespoon of oil - oil should slick across the surface of the pan and moire. Work with no more than 2 salmon cakes at a time. Fry on one side for 2-3 minutes. Place one hand on top of the salmon cake and carefully edge a spatula under the cake. Gently turn the cakes over and continue to fry for an additional 2-3 minutes. Set cakes on a tray lined with paper towels. Continue with the other cakes. Serve salmon cakes with lemon wedges and top with aioli. These were delicious! I ate the leftovers cold which might be weird but they were amazing that way too! Thanks so much for the recipe. Recipes sound great, but I can’t seem to put them on Pinterest from your site. Why not? There should be two ways to Pin it to the site — directly under the first photograph are social share buttons and one of them is for Pinterest. Or you can scroll down to the Pinterest “Pin” at the bottom of the article and there should be a Pinterest button that hovers in the top left corner of the image. You should be able to click either of them to save it. Should the salmon be cooked first? no the salmon is raw, it cooks as you pan fry the patties. My husband loves salmon so I know he’d enjoy having these for dinner! 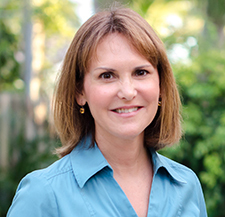 Let me know how he likes them, Liz! These look so delicious. I love the crunchy crispy coating! These look and sound so good! I’ll definitely have to give them a try soon! Yum! Oh my, those salmon cakes looks scrumptious and so crunchy! Yum! The sauce goes perfectly! These look delicious! My hubby would absolutely love these! Isn’t it amazing how you can take abandoned ingredients and turn them into something wonderful? And these salmon cakes are certainly that. I just adore that crunchy panko crust on the outside and I bet the mustard and capers give it such a nice zing. One of my favorite things is to use leftovers to make something else fabulous! I’ve never made salmon cakes and I see that I am missing out. Love it! Salmon cakes are always a treat!